Injury Lawyer Jonathan Clement from the Kent firm Thomson Snell and Passmore explains how sports injury claims work, and how they apply to amateur sports. The idea of pursuing a sports injury claim might not be something that you have ever thought of when it comes to amateur sports. But there are times when sporting behaviour crosses the line of what’s acceptable and at that point the idea to claim compensation might become very real. You may have seen high-profile legal cases involving professional sports players suing each other for vast sums of money, but where does the amateur sports player stand? Should you be busy preparing a case right now for that dodgy 50-50 tackle you were involved in last week? Don’t worry, we’ve enlisted an expert to explain it all. Jonathan Clement is a Partner at the Dartford and Kent law firm Thomson Snell & Passmore LLP, specialising in Clinical Negligence & Personal Injury. He’s seen a number of sporting-related cases over the years, which puts him in a perfect position to enlighten us on where we stand. By the way, Jonathan practices under English law and, whilst other countries may have similar legal concepts, you should do your own research. In any case, even if you are based in England, the interview below does not constitute legal advice. You should always consult a reputable specialist if you want advice on any individual case. So, Jonathan, is it really possible to get injury compensation whilst playing 5-a-side (or any other amateur sport)? It’s always possible, because tort law in this country is such that if you can prove negligence and there has been some damage as a result of that negligence then there may well be compensation available. I’ve done a number of sporting injury claims over the years. It’s not a specific area of law. The principles, in terms of negligence, are the same whether you are dealing with an injury at work or on a sports field. Sporting injury claims are notoriously difficult to win, and I haven’t yet come across one in the 5-a-side context, but there are lot in professional football where individuals have had legs broken, or career-ending injuries. What you have to show is that it’s not just a lapse of judgement by another player, or clumsiness; it needs to be more of a case of ‘reckless disregard’. So in a football context, that could be a case where the ball is absolutely nowhere near a player, and somebody just races across and gives them a two-footed lunging tackle and breaks their leg. Ouch! What about the less obvious incidents? Could they still be subject to a sports injury claim? If it’s a 50-50 challenge, for example, and you’re going for it but get it wrong or even if you go over the top, in that split second you’re just fighting for the ball so it’s going to be difficult to prove that you went beyond the normal duty of care that you would have for another player in the game. A player goes into a 50-50 challenge knowing that there is an element of contact risk. To be a valid claim, it would need to be something over and above the norm within a game. That can be very difficult to prove as, in some ways, you’re trying to prove what was in somebody’s mind. It is not that you necessarily need to show ‘intent’ but if a player had shown reckless disregard of the rules for your co-players safety and it was reasonable to say they were negligent, then there may be a claim. If, for instance, somebody was lying on the floor on top of the ball and unable to get up because they’re injured already but you’re still piling in and kicking them because you’re trying to get the ball and kicking the player as you do so, that could be seen as reckless disregard. There is also a public policy aspect to this. The legal system doesn’t want to be setting too high a standard on what is a recreational and fun hobby. Are there many cases of sporting injury claims in an amateur context then? There are not a huge number. The ground-breaking case was one called ‘Smolden’, which was a rugby injury where the scrum was not controlled properly throughout the game. Eventually Mr Smolden broke his neck in a collapsed scrum and decided to sue the Rugby Football Union and the referee. He was ultimately successful in the court of appeal. That’s an example of the referee having some responsibility. He knew the rules of the game but disregarded them, putting the player’s safety at risk. You can’t say that a player volunteered to the risk of being badly injured by somebody going outside of the rules. In a lot of cases this ‘reckless disregard’ can be hard to prove. In football, even going up for a header and getting somebody’s elbow in your face would be difficult to prove because again it’s in the heat of the moment, you’re both going for the ball and how do you ever prove intent? It could just be that the arm has naturally gone up when they’re jumping. But cases do come along in amateur sports. I’ve done golf injury claims where people aren’t saying “fore” or are negligent with their shot. I even acted for a rugby referee where somebody threw a bottle of water to him. They didn’t say “here ref, have a drink” or anything to alert him to the bottle in the air. The bottle hit him in the head and knocked him out resulting in a head injury! How injured do I need to be to claim for an accident? Do I need to prove some kind of loss of function / loss of earnings? An injury worth less than £1,000 would include things like heavy bruising; something not particularly serious which will clear up pretty quickly, within a few weeks. The amount you can claim depends on the injury and its effects. There can be three elements to a claim. General damages: the pain, suffering and loss of amenity – the injury and hassle it’s caused you. Special damages: tangible losses and expenses. Things as small as a few pounds for a prescription charge through to hundreds or thousands of pounds for loss of earnings. Future loss: if you’re going to be off work for a very long time you can claim future loss of earnings or if you’re going to need surgery then you would claim the private cost of that treatment. So there’s no level of injury that you need to bring a claim, but there are practicalities that you may need to consider. It’s always worth talking to a specialist; a lawyer would tell you if it’s worth bringing the case (or not) and the reasons why (which could include the ability of the defendant to pay). Practically, if I’ve been injured, what am I supposed to do to make a claim? Do I start asking for the offending player’s details? Generally people don’t carry a notebook and say “right give me your name and details”. It’s not like a car accident where you can get somebody’s insurance details. If it’s a very aggressive individual and it’s akin to an assault. You might want to think carefully about taking a more formal step of involving the police and bringing a criminal case rather than a civil one. But if it’s reckless disregard then first and foremost you should concentrate on yourself. You’ve got 3 years from the date of the incident to bring any claim for an accident. There’s no rush, and generally speaking people aren’t thinking about making a claim straight away. It’s usually afterwards if they go to the hospital and, for example, they damaged their nose and are told that they’ll always have breathing difficulties, or that they can’t return to work for 6 months. That’s when people’s thoughts turn to wanting to know what their rights are, and I would encourage them to take specialist advice at this point from somebody who has a track history in doing this type of claim. Claims can take a long time to progress, but if you’re dealing with a reputable firm such as ours, we’ll look to get you rehabilitation at an early stage. That’s very much at the top of our list as that’s practical help that you can get straight away. Might there be a view that this is just ‘ambulance chasing’ – aren’t we at risk of ruining one of the nation’s favourite activities if we introduce this culture? No, it’s about people knowing their rights and people are getting better at this. It’s easy to be negative about lawyers, until you actually need one. Our clients have said some very nice things about us when it comes to the end of a claim, and that’s not because they’ve got a cheque in their hand. It’s because they’ve had the help they need with life-changing injuries. I don’t have the numbers, but there are very few amateur sports injury claims that go through every year, and I have not yet seen one for 5-a-side football. This post isn’t intended to be an advert for any particular firm, nor does it constitute legal advice. 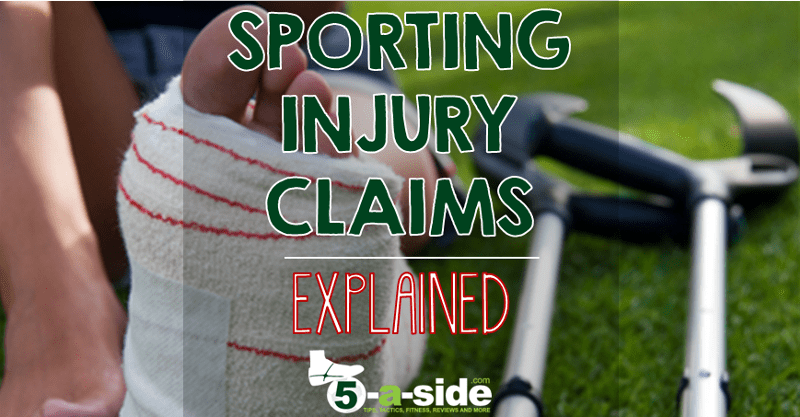 It’s simply to provide some background from an expert so that you have some basic knowledge of sports injury claims in case you ever needed it. Hopefully you won’t. To be absolutely clear, 5-a-side.com has no relationship with Thomson Snell & Passmore LLP, nor any of its employees. We have not received payment or any other form of compensation for this article, nor have we entered into any commission arrangement for referrals that this article might generate. Other law firms are available. Thanks to Jonathan for his time and help on this article. Interesting article on sports injury compensation. If you play sport at any EU sports centre that was built after 2008 in the sports hall and injury results and the floor does not conform to En14904, European standard for indoor sports standard, then i think you would be more likely to win a claim. This standard was brought in to protect users by setting minimum safety standards. Hi Darren, that’s an interesting additional thought that I hadn’t even considered. Yet another thing to think about!